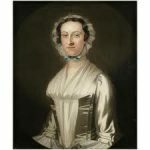 Elizabeth Archer, daughter of Rebecca Thompson and Sampson Archer, had come from northern Ireland in 1737 with her family, who took claim to 1000 acres near Natural Bridge, VA. In 1741, Elizabeth married Robert Renick, who had settled in Augusta County, VA, in 1740. They lived in what was then the Virginia frontier. Virginia records show that on June 10, 1740, Robert Renick received a patent to 400 acres of land on the Buffalo Lick Branch in Augusta County, VA, and on November 10, 1757, obtained a patent to 90 acres on Purgatory Creek, a branch of the James River. Robert Renick joined the Virginia militia and quickly advanced through the ranks. He was granted 300 acres in Orange County, Virginia, in 1745. As a Captain of Horse (cavalry), he was active in warfare with the Indians. 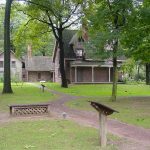 On July 25, 1757, a band of about 60 Shawnee Indians stole past the fort, which was near the Renicks’ wilderness home, and captured Elizabeth and her children Joshua, William, Betsy, Margaret, Nancy, Thomas, and Robert. The Shawnee went on to a neighboring house where Robert was visiting, and killed and scalped him in view of the children. The Shawnee and their captives then embarked on a long journey to the Miami Valley Indian town in Ohio. Elizabeth carried her son Robert, who was about eighteen months, the greater part of the way to Chillicothe, Ohio. But his incessant crying irritated the Indians, and they killed him by dashing his head against a tree. On arriving at the towns on the Scioto River, the children and Mrs. Renick were separated, divided up among their captors, and scattered. Elizabeth was pregnant at the time. Soon after reaching the Indian towns, she gave birth to a male infant and named him Robert, after his murdered father and little brother. Elizabeth’s son Joshua, who was about five years old, was taken to Piqua and raised by Tecumseh’s parents. Joshua became the companion of Tecumseh and his brother, the Prophet. He ignored the pleas of his relatives to return to civilization, remained with the Indians and became a Miami chief. He took an Indian wife, amassed a considerable fortune, and died near Detroit in 1810, according to one account. 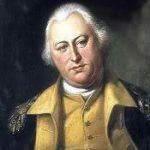 In the autumn of 1764, Colonel Henry Bouquet was the commander of Fort Pitt (Pittsburgh). To subdue the ongoing Indian uprising, he led a force of nearly 1500 militiamen and regular British soldiers from the fort into the Ohio Country. On October 13, 1764, Bouquet’s army reached the Tuscarawas River. Shortly thereafter, representatives of the Shawnee, Seneca, and Delaware came to Bouquet to sue for peace. Bouquet then moved his army from the Tuscarawas River to the Muskingum River at modern-day Coshocton, Ohio. This placed him in the heart of tribal lands and would allow him to quickly strike the natives’ villages if they refused to cooperate. As part of the peace treaty, Bouquet demanded the return of all white captives, in exchange for a promise not to destroy the villages or seize any of their land. In compliance with this stipulation, Elizabeth was ransomed with two of her sons, William and Robert. Betsy, her daughter, had died on the Miami. Her son Thomas returned in 1783, but soon after left and settled on the Scioto, near Chillicothe. The return of the captives caused much bitterness among the tribesmen, because many of them had been forcibly adopted into Indian families as small children, and living among the Native Americans had been the only life they remembered. Some white Indians managed to escape back into the native villages; many others were never exchanged. However, Bouquet managed to return more than 200 white captives to the settlements back east. 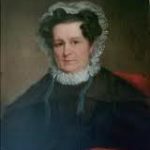 Elizabeth Renick had to contend with children who didn’t know her, who didn’t know each other, who had adopted Indian ways, and who feared leaving the tribe. William Renick became a soldier and spent his life fighting Indians. He served in an expedition that resulted in the Battle of Point Pleasant, where the Shawnee leader Cornstalk was killed. Elizabeth Archer Renick was brought to Staunton, VA in 1767, and lived out her days in the area where her home had been attacked.